Dubai: Technology would be a major catalyst that would drive the economic growth in the UAE, Dr Abdullah Mohammad Bel Haif Al Nuaimi, Minister of Infrastructure Development told delegates at the Annual Investment Meeting. The comments come two weeks after Uber agreed to buy its Middle East rival Careem for $3.1 billion (Dh11.39 billion), in the biggest tech deal that the region ever saw. Earlier in 2017, Amazon bought Middle East online retailer Souq.com. Additionally, to boost the start-up culture in the country, the UAE plans to give long-term visas for 100 Arab start-ups. The UAE “has been keen to keep abreast of new trends and their applications in various areas of trade. We strongly believe in the importance of joint efforts in narrowing the digital divide, in order to capitalise on the digital economy,” Al Nuaimi said on the first day of the AIM, which was attended by 20,000 delegates from 140 countries. The UAE continued to rank number one in terms of attracting FDI and had inflows worth $10.4 billion in 2018, according to estimates from the central bank. Economic growth came in at 3.7 per cent for 2018, and the outlook remains ‘optimistic.’ The IMF estimates the world economy will continue to grow in 2019 by 3.5 per cent, and expects the UAE economy to outperform at 3.7 per cent this year. “The UAE has paid great attention to the development of infrastructure and roads, being aware of its importance in promoting investments. The country has also been able to achieve internationally high rankings on global competitiveness indicators in this domain. These include second place in satisfaction with streets and highways, which constitute one of the best infrastructure in the world,” Al Nuaimi said. The UAE has been ranked number one in the Arab world in the World Bank’s ease of doing business. The country was fast closing in to become one among the top 10 in the Ease of Doing Business ranking of 190 countries by the World Bank. 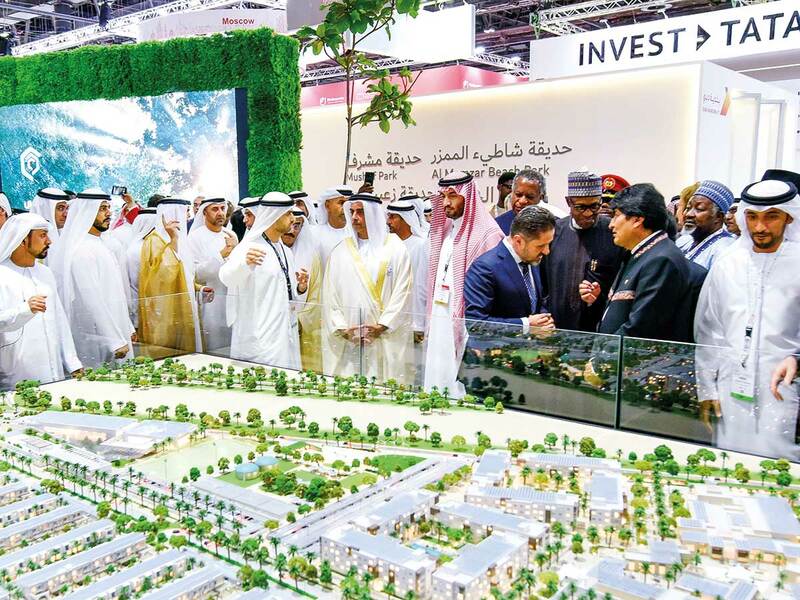 “Furthermore, the UAE can accomplish some achievements through successful partnerships between private and public sectors in the area of infra projects, reflecting the importance of joint endeavours by both sectors and attracting more investors,” he added. Muhammadu Buhari, president of Nigeria highlighted the importance of inclusive growth in the digital world.